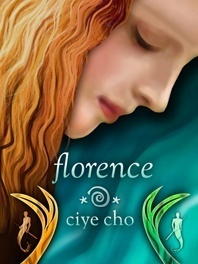 Florence by Ciye Cho Review - My Life Is A Fairytale That Will Never End. You know, I've never read a book about mermaids. Dunno why, but they somehow didn't appeal to me. And then I got this book for review, and I was like "Seriously? Mermaids?" I thought about it and then decided to accept it. And let me tell you, Oh my god! This book is awesome. The world that Ciye created is stunning. Bright colours, amazing characters and an intrigue, unique story. It's quite fast paced and the story flew by like a blur. The story is told in the first person, and the narrator is a girl named Florence. Sometimes there were chapters in the third person, so the reader can actually see also the things that doesn't happen directly to Florence. It gives the reader a better understanding. Florence in the beginning of the book was a really quiet girl. Noone noticed her. Noone talked to her. She went with the school to a trip on the beach. She went swimming by herself and diving in the water got her face to face with a merman. He kidnapped her. She woke up in Neimela, a bright coloured world underwater. Stunningly beautiful. Somehow she was allowed to stay in Neimela. She became best friend with the Princess Yolee. Yolee is cheerful, nice young girl and she really likes Florence. She introduced Florence into the underwater world. Florence finally found a place where she belonged. This book was a fast pacing through story which will leave you crave for more. I really enjoyed reading it. So, if you like mermaids, action, and with romance filled story, Florence is perfect for you! I love that painted cover! Mermaids really are becoming popular.